So Shay: The Shop is LIVE Y'all! The Shop is LIVE Y'all! I can't believe I just typed that. 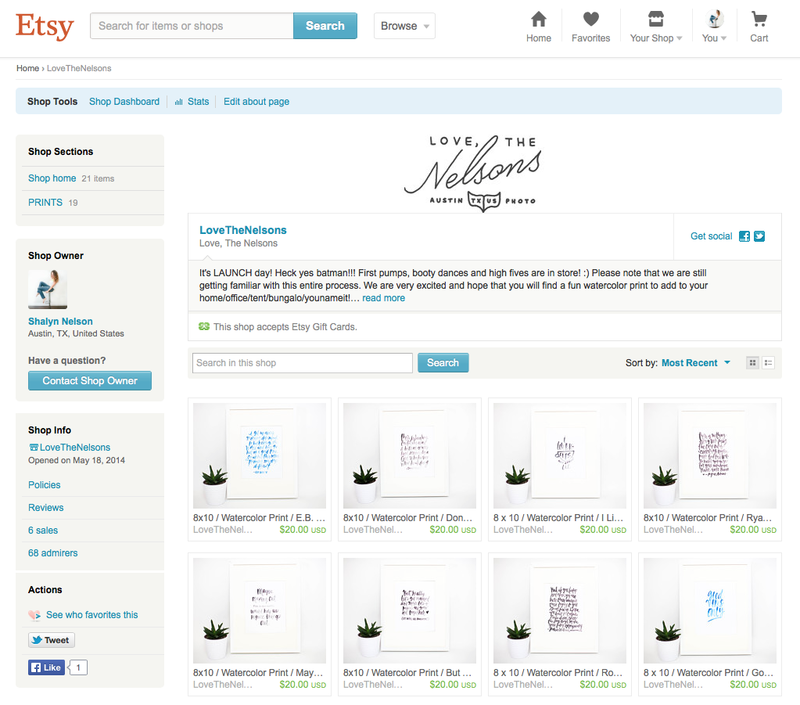 I never in a million years thought I would have an Etsy shop. I still can't believe so many sweet people love these things. However, I am really, really, over the moon thankful. It means the world to this heart of mine. Fist pumps, booty dances, and high fives! For the time being, we are only offering 8x10 prints. This will eventually change, but we want to see what our best sellers are first before we start taking on different sizes of our prints. All orders will be sent to you between 7 and 14 days. If you have any questions about our shop, please don't hesitate to e-mail us at hello@lovethenelsons.com or leave a comment below and we will do our best to get back to you as soon as possible. Thank y'all so much for all your love and support as we enter this side journey of AWESOMENESS. We can't even put into words how overwhelmed we are with gratitude. Please be sure to head on over to instagram to see how you can win a free print too. Holla FO A DOLLA! ShareThe Shop is LIVE Y'all! So, so excited that the shop is finally open! Can't wait to add these pretty prints to the DeLong casa! xoxoxo big hugs muffin!! FINALLY! So excited for you and I plan on blowing up all forms of social media for you. Love seeing the prints you made for me in the shop so I will be able to link to them! I am so proud of you! So excited for you! I know you will do GREAT! Yayyy!!! So excited for you, can't wait to place an order!